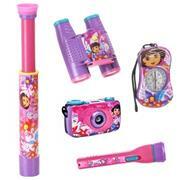 This wonderful Dora the Explorer Adventure Kit lets the imagination of your child run free. Adventure kit come with a focus free 35mm Camera, flashlight that illuminates 10 feet, working compass, binoculars, and telescope. The adventure kit has enough items to share the adventure with a group of friends. It will keep your children entertained for hours.